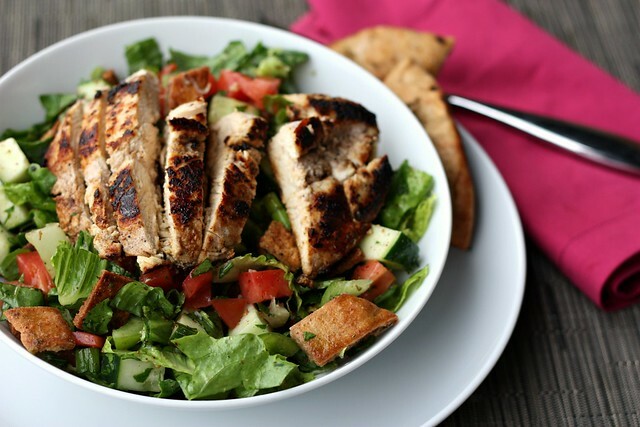 Fattoush – Elly Says Opa! I first posted fattoush on this blog over 5 years ago, but it needed an update (both the pic and the directions – because there were no directions, apparently). It’s one of our favorites and has practically become a weekly staple with this brutal weather we’ve been experiencing. We’d actually be having it again tomorrow, except I ran out of tomatoes. Fattoush is a Lebanese/Middle Eastern salad made with vegetables and pita pieces. Often the pita is fried, but I healthify this by baking whole wheat pitas (which are just as crispy). The salad is very tart and citrusy, from the use of both lemon and sumac. I’m a big fan of lemon, so it’s no surprise this is one of my favorite salads. Typically, we turn this into a main dish with the addition of some grilled chicken. More often than not, I use the same marinade recipe I do for shawarma, but even just a simply seasoned chicken breast is fine, since the salad itself is packed with flavor. Oh, and a little feta cheese on top never hurt anyone. To make the pita crips: Preheat the oven to 425. Toss the pita squares with the olive oil and zaatar (if using; if not using, add a small pinch of salt) until well-coated. Spread onto a large baking pan and bake for about 8-10 minutes, or until crisp. To make the dressing: Whisk together the lemon juice, sumac and garlic. Continue to whisk while streaming in the oil. Season to taste with salt and pepper. To make the salad/assemble: Combine all the salad ingredients in a large bowl. Toss together with the dressing until combined and then add the pita chips (or just serve them on top of each salad).